Throughout the Myrtle Beach and Grand Strand areas, there are hundreds of hotels and condos scattered along the coast, but none provide an experience quite like that of Bali Bay Myrtle Beach. This luxury oceanfront resort is situated in a superb location in the heart of Myrtle Beach and features on-site amenities that will ensure your stay is one that will stand out in your memory for years to come. The modern condos in Myrtle Beach at Bali Bay Resort feature spacious floor plans and sizes for any style or preference. With luxury condos ranging in size from 2 bedrooms to 7 bedrooms, we can match your vacation style with the accommodations that are perfect for you. Coming to town for a large gathering? The condos at Bali Bay are the perfect places to host your family reunion Myrtle Beach group. Our 7-bedroom oceanfront penthouse condos feature over 5,000 square feet of living space, with 6.5 bathrooms and comfortable accommodations for up to 16 guests! You and your group will love the stylishly modern furnishings, granite counter tops, and breathtaking views of the Atlantic Ocean. If you prefer a smaller space, our 2 and 3 bedroom luxury units provide the same degree of excellence on a smaller scale. All of the modern condos at this new resort in Myrtle Beach feature large, fully-equipped kitchens, complete with major appliances and all of the cooking essentials you may require. Perfect for nights spent in, make this spacious kitchen your own and make your favorite home cooked meals throughout your stay. Enjoy the comfort and privacy of your own balconies, which overlook the sandy shore of the beach below. When it's time to explore the resort, you'll find a picturesque outdoor, oceanfront pool, as well as a relaxing outdoor, oceanfront Jacuzzi. Swim or lounge in peace, while you listen to the sounds of crashing waves nearby. When you vacation at Bali Bay Myrtle Beach, you'll be living in luxury throughout the duration of your stay, and you'll be within close proximity to all of the most exciting attractions and hotspots in the area. 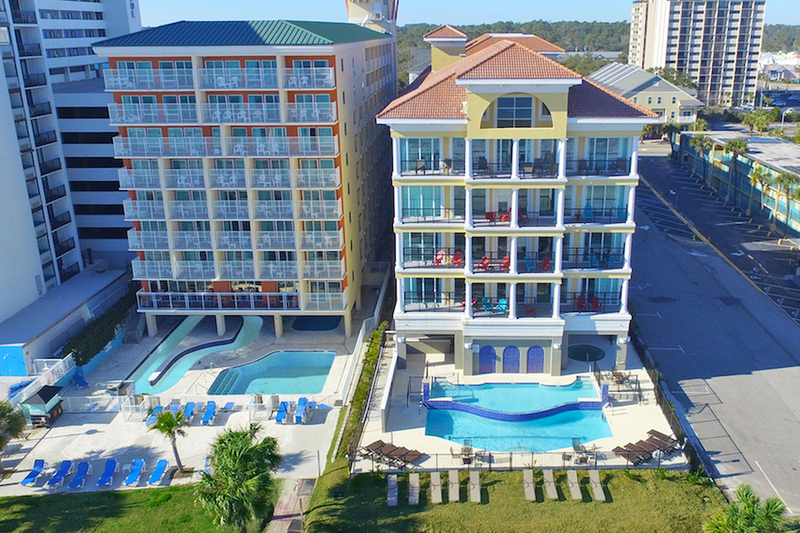 This modern, oceanfront resort is just across the street from Family Kingdom Amusement Park and merely blocks away from the Myrtle Beach Boardwalk and SkyWheel. Enjoy nearby restaurants like Pier House Restaurant, Villa Romano Italian Restaurant, and dozens more. Take advantage of the amazing location and fabulous amenities brought to you by Bali Bay Resort Myrtle Beach whenever you bring your next beach vacation to the Grand Strand. Our modern, large, oceanfront condos offer the greatest in style, luxury, and vacation experience. Make Bali Bay your next home-away-from-home when you visit Myrtle Beach!